Smoke from wildfires in Alberta and B.C. 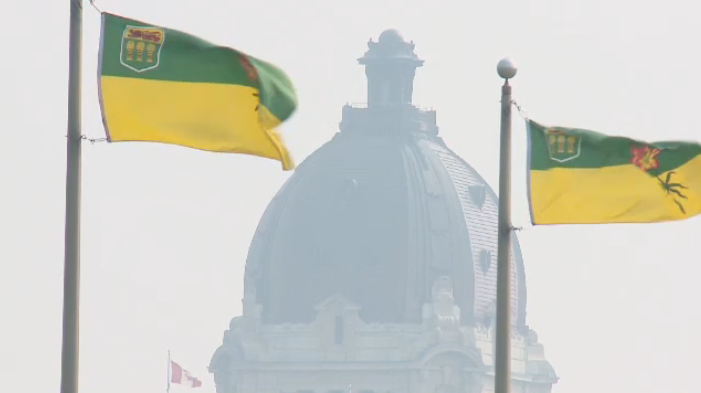 has prompted Environment Canada to issue an air quality statement for Regina and Saskatoon. According to the weather agency, the smoke is causing poor air quality and reduced visibility in a large portion of Saskatchewan. The wind is blowing smoke across the border from Alberta into Saskatchewan. Environment Canada says the smoke will likely last through Wednesday night and into Thursday morning. People with lung diseases like asthma or COPD may be particularly sensitive to the pollution in the air. People in the impacted areas may also experience coughing, throat irritation, headaches and shortness of breath. More information can be found at airhealth.ca. A heavy blanket of smoke settled over Regina on Sept. 7, 2017.